That Vasily Petrenko has had a major impact on collective psyche of the Classical Music world is not open to doubt. Every disc that he has released to date has been greeted with at least praise and in most cases adulation. Given that my own collection is rather saturated with Manfred Symphonies and Shostakovich symphony cycles for purely economic reasons I’ve managed to miss hearing any of his recordings until now. Anyone coming new to this repertoire via this disc can rest assured that they will be buying well recorded, superbly played, convincingly argued versions of all three works. Would any of these go straight to the top of my preferred playlist? – I would have to say no. As it happens, I took part in the blind reviewing test on this website recently comparing ten versions of Isle of the Dead [review]. One of those versions was the performance recorded here and whilst the other two reviewers did place that at the top of their lists I did not. Returning to that performance as part of this review and listening to it again my reservations hold true for the entire programme. But back to the work that opens the disc, Rachmaninov’s last major orchestral score the Symphonic Dances Op.45. For a man who wrote barely a dozen orchestral works Rachmaninov’s handling of a large modern symphony orchestra is never less than superb and the RLPO are fully equal to the severe technical demands the music makes of them. Quite whether the ‘progress’ the orchestra has made under Petrenko is down to any shaman-like quality of the conductor or the economic/employment reality that means that the lowliest rank and file post in this – and any other - British orchestra will receive literally hundreds of applicants from all over Europe is open to question. Orchestras, as performing groups, are getting better for the simple fact that more better trained players are applying for fewer posts; as they say – ‘you do the math’. I’m in comparative review mode again here – although this time I know who the rival versions are by! From my point of view this performance is strongly challenged by Previn/LSO on EMI, Svetlanov/USSRSO on Regis (crude, live, thrashed to within an inch of its life and utterly compelling), Ashkenazy/Concertgebouw on Decca, Jansons/St Petersburg Philharmonic also on EMI and even the often-overlooked Fedoseyev/USSR Radio SO on deleted Olympia. On the plus side it is always a pleasure to hear an individual, carefully thought out interpretation. This is not an anonymous run-through at a rehearse/record session. Petrenko is very happy to impose his personality on both the orchestra and the music – take it or leave it you know who is in charge. Obviously the greatest interpretations are those where the combined sum of the composition, interpreter, and performers seems greater than the sum of the individual parts. Clearly – this disc having received rave reviews elsewhere – many think it does just that. I do not. I find that Petrenko falls into some interpretative mannerisms which he does not quite bring off. In essence – in the tradition of many of his conductor countrymen – he goes for extremes of dynamic and tempo. This is an exciting and dramatic approach but one that relies on these extremes still having a degree of inter-relation. My main problem is the way in which the slower passages lapse into languor and a kind of torpidity. The Symphonic Dances do have extended reflective passages but as Anthony Bateman’s interesting liner-note points out the work’s origin was as a ballet for Fokine. His death thwarted that project but these are, in some way, dance originated even if at several removes. Previn, in the second dance in particular, at a very similar overall movement timing, manages to keep the lilt of the waltz gently pulsing. In turn this allows the decorative woodwind filigree passage work to twist and adorn the string lines. At Petrenko’s slower speed the waltz is all but lost and the wind lines – perfectly executed though they are – are unable to register as the snow flurries they surely are. The first dance, after a typically urgent and incisive opening becomes positively becalmed [3:00 – track 1] and the famous saxophone solo – beautifully played – seems to my ear soporific. As this passage develops and the tutti strings enter I don’t feel the emotional temperature rising. Also, this is one of the passages where I have an issue with the actual recording. Modern recordings do make a virtue of offering extraordinary internal detail in complex scores. The engineering here is a model of that approach and I am sure many listeners will revel in elements of these scores that they can hear (although oddly the contrabassoon stays well back in the mix). Personally – and I do understand this is a personal view – I prefer a balance that reflects the sound as it would arrive at a centre stalls seat. Composers double instruments very carefully to produce a resultant sound – they do not want a listener to hear that it is a horn AND cellos AND second bassoon for example. So here, when then strings take up the saxophone melody you hear the violins and the cellos not the combined string section – Previn is particularly successful here in both engineering and performance terms and actually I rather like the coolly sinuous Fedoseyev as well – this section being a logical extension from the flowing (rather watery) saxophone that preceded it. Another prime example for me where sections simply do not logically relate is at the very end of the work. Petrenko works up a thrilling head of steam for the closing pages [track 3 – 11:00 onwards] pursued into the maw of hell by as many nightmarish huntsmen as one could imagine. In any performance the moment when the massed (hunting?!) horns hurl the Dies Irae theme that’s has been lurking in Rachmaninov’s consciousness for the previous fifty years or so is magnificent [track 3 – 12:14] – and here it is as good as any and better than most. It IS viscerally exciting but at complete odds with the central panel of this dance where Petrenko pulls the tempo back to the point where the music stalls. One person’s sensuous dalliance is another’s indulgent wallowing – you take your pick! The analytical recording prevents the brass choir sounding as one – the microphones picking out (very fine) individual lines before the acoustic has had a chance to blend them. Quite often Rachmaninov does use the brass as a massed choir – echoes of the Russian Orthodox church in the great chorales they play - and I definitely prefer a blended sound there. Going onto Isle of the Dead I would refer readers to my comments as part of the blind review. In essence I found some sections thrilling but again the slower passages lose momentum. There is another example of odd tempo relations; the central portion of the tone poem refers to the soul’s yearning for times past. Rachmaninov very specifically instructed that this passage should be significantly faster and more nervy than that which preceded it. As it happens, my favourite version of the 10 from Svetlanov turns that notion completely upside down and starts that section in an ecstatically luxuriant manner. BUT, the reason that works is because Svetlanov’s eye is on the longer game. From that point on there is an extraordinary slow long turning of the emotional screw through to the piece’s collapse with three brusque gestures of musical dismissal. Petrenko does the reverse; the initial section is ideally nervy and fluid in tempo and emotion – exactly what the composer had in mind I’m sure [track 4 11:21] This sections builds to two great climaxes, the second supplanting even the power of the first [13:33]. Yes the score IS marked ‘meno mosso’ after this first climax which literally means ‘less movement’. Petrenko chooses to interpret this as a lot less movement which means the section lumbers and by the time the tempo does pick back up for the second climax [15:37] there has had to be such a gear change in tempo that the whole feels less inevitable than it should. That being said Petrenko gets the three dismissal gestures absolutely right – and right on the tempo that he has then reached. All of this is down to taste and I must reiterate how refreshing it is to hear a performance that is so clearly thought out – like it or not you are in no doubt that this IS Petrenko’s conception of the work and it is not a bland vision at that! The disc is completed with the early tone poem/fantasy The Rock. As an interesting insight into the talent of Rachmaninov at the age of just 20 it is valuable – Tchaikovsky was quick to recognise the ability this and other contemporaneous works signposted. Also, as a filler it adds to the economic value of the disc. 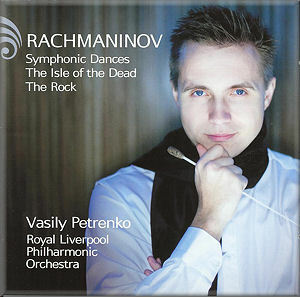 I have to be honest and say that of all Rachmaninov’s orchestral works this is the one I am least under the spell of. But were a performance to sway me it would be this. All of the Petrenko virtues of impulsive musical freedom and dramatic extreme seem here to serve the narrative of the Chekhov short story particularly well. Again the orchestral playing is both powerful and deft – this is going to be by definition an unknown work to most players and the clarity they bring to it is a tribute to their combined technical resource. The main two works should be in the collection of everyone who cares about great music. One final thought; in the programming of the disc surely it would have made more sense in every respect to place the music chronologically. Instead we have it in reverse. I can only assume this is to ensure the disc’s ‘title’ work comes first. How much more satisfying it would have been to hear the composer’s progression from promise to masterpiece – easily achieved with a little programming of the CD player of course so not exactly a disaster – just odd! Even the liner-notes give the music in composition order. So, a fine disc of wonderful music well performed by the excellent RLPO – who were a great orchestra pre-Petrenko in case anyone had forgotten that. Not the final word on either of the two main works but a valid and passionate vision. Something by way of an extended PS! Ultimately – and this is not the fault of the conductor or orchestra – I am rebelling against the notion that suddenly one performer/performance suddenly supplants all others; ‘the king is dead long live the king’. No great work of performance art can ever be defined by a single performance – and every performer will tell you that. Unfortunately the promoters and sellers of performance art will try and persuade you that all you need is this (their!) one performance. Likewise, there is this strange need for there to be a sense that the ‘now’ is better than the ‘then’. The sub-text on most websites for orchestras is how wonderful everything is now – Edward Gardner is extraordinary at ENO, Stéphane Denève revelatory at RSNO etc etc – and I’m sure they both are - but by implication this diminishes or even dismisses what came before – tough luck on Paul Daniels and Mark Elder at ENO and the likes of Neeme Järvi and of course Alexander Gibson at the SNO (as was). It’s the “new and improved” school of advertising which always strikes me as meaning the previous version of that breakfast cereal or washing powder was clearly rubbish! Again, I stress that I guarantee it is not the performers themselves who promote this notion. What struck me most forcefully doing the comparative reviews mentioned above was how many fine performances of this single work (by chance the ten versions did not include three of my personal favourites at all) there were and the more there appeared the less relevant somehow narrowing that down to a single version became. A single version will be a compromise – lucky the listener indeed who finds themselves totally convinced by one performance to the exclusion of all others, a reviewer’s choice will be the one that provides them with their own best ‘fit’ technically and emotionally. Isn’t the glory of classical music that a great work is an ever-evolving landscape that can change with the seasons of one’s life? I do mourn the fact that orchestras sound increasingly and uniformly lean, mean and muscular yet strangely anonymous. Technical perfection is a given from Iceland to Malaysia and Sao Paulo. Perhaps a more interesting blind listening would be to focus on the performers not the repertoire! My guess would be that it would be all but impossible to ‘place’ an orchestra with about four exceptions worldwide. The only countries which still have idiomatic orchestras are those where the economic limitations have meant that players from around the world do not seek out posts there. On a recent visit to Prague I heard the Czech Philharmonic in the Dvorak Hall sounding quite magnificent – and Czech! When I looked at the orchestral list it was clear these were players born and bred in the country. Clearly this is a Pandora’s box that will never be closed and in no way am I the slightest bit xenophobic. All I know is that I miss the buzz-saw brass in Shostakovich and Tchaikovsky, the mellow horns and woody clarinets in Dvorak and ‘Kingsway-Hall-string-glow’ in Elgar!